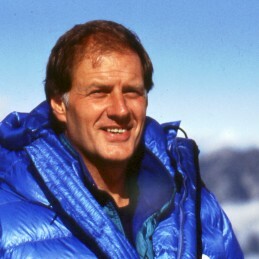 For over 30 years, John has led expeditions to remote regions of Northern Norway, Peru, Nepal, China, Greenland, and has explored areas of Arctic Canada on six occasions, making many first ascents of previously unclimbed peaks. John fulfilled a lifelong dream by organising and taking part in Canada’s first successful expedition to reach the top of the world – the 29,028 ft. summit of Mount Everest, the world’s highest mountain. An educator by training, John established One Step Beyond WorldWide in 1984 and he has since delivered more than 1,800 keynote presentations and seminars to total audiences of over 1,000,000 people in 44 countries around the world. His mission is to encourage people to push beyond their self-imposed limitations, to be more personally accountable for their own actions, and to embrace effective teamwork by valuing the contribution of others. His book, Straight to the Top and Beyond, uses the metaphor of adventure to develop an innovative philosophy for achieving success in the rapidly-changing and unknown world of the 21st century.